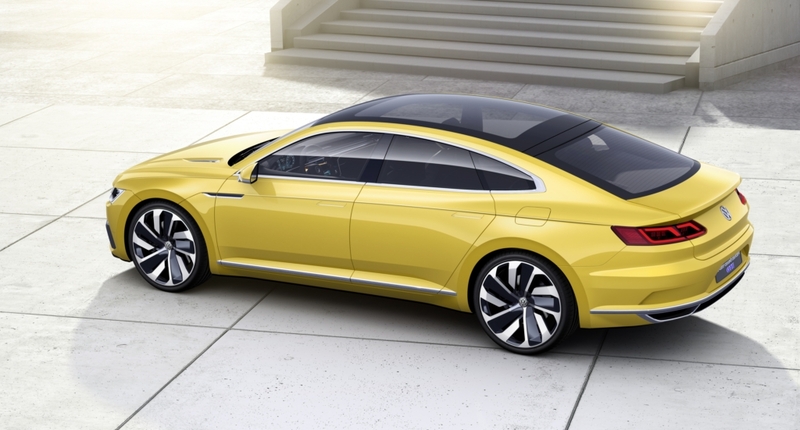 Volkswagen will debut the Sport Coupé Concept GTE at the 2015 Geneva International Motor Show, heralding a new and progressive Volkswagen design language. “Evolution and revolution come together in the Sport Coupé Concept GTE. 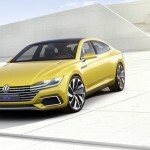 This concept is based on Volkswagen design DNA, which has been visibly sharpened even more. It shows how the highest-volume brand of our Group is shaping the immediate future,” says Walter de Silva, Head of Design of Volkswagen AG. The interior of the Sport Coupé Concept GTE is as innovative as its exterior. 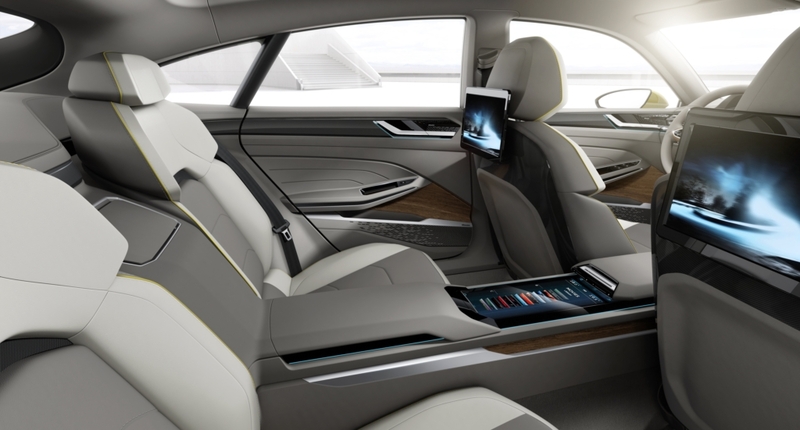 It features extremely clean design, matchless ergonomics and new interactive interfaces between human and machine—including the use of the driver's biometric data and a new Active Info Display that has a 3D appearance. The upshot is an avant-garde interior ambience that is in complete harmony with its expressive exterior design. Front end. 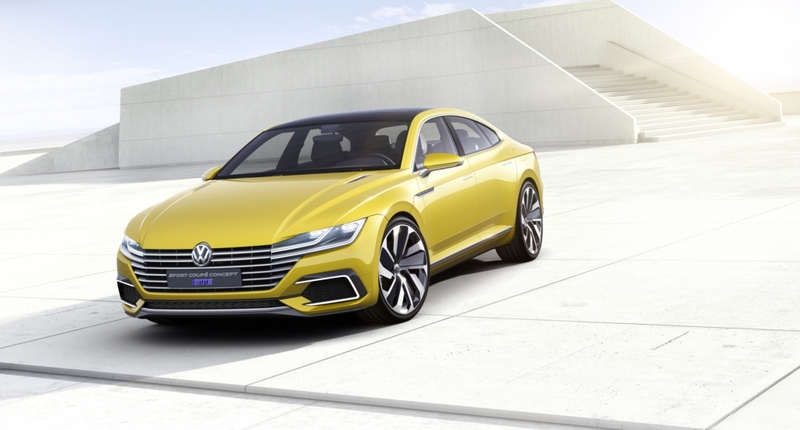 The radiator grille, headlights and VW badge merge into a completely new interpretation of the Volkswagen front end. The designers specifically emphasized three-dimensionality. Towards its outer edges, the radiator grille borders the LED dual headlights that are framed by an aluminum radiator grille crosspiece, whose ends take an upward turn, like the winglets of a modern jet airplane. This shape is repeated on the exterior and in the interior, running as a common thread throughout the vehicle's design. Beneath the two upper radiator grille crosspieces, there are four additional bars. Each trim piece is narrower than the one above it, and together they form a wide "V" that is framed by body-colored area of the bumper. Silhouette. 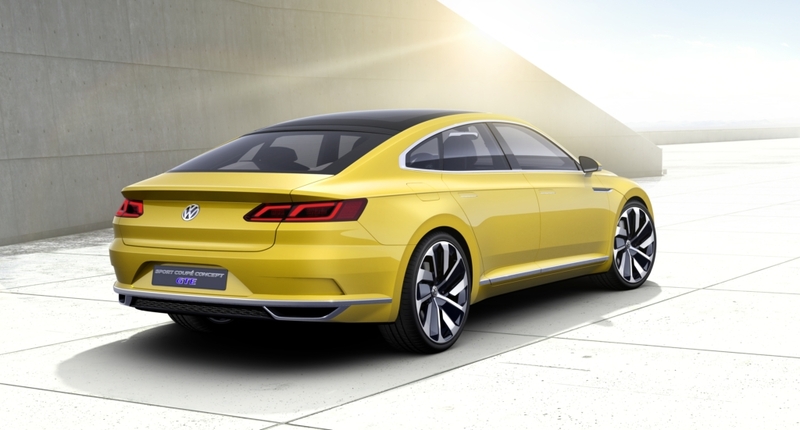 The Sport Coupé Concept GTE is a coupé with four doors and a hatchback. This approach led to a design that emphasises long, extended lines, a low overall height and an athletic body form. The car's silhouette is uncompromised: the roofline assumes the shape of a flattened curve extending from the A-pillar—set far back for a long hood—to the rear body. The extremely low-set C-pillar, which develops seamlessly from the roofline, dominates the back end of the car. Air vents in the front fenders and hood have chrome elements that mimic the stylistic theme of the winglets around the headlights. The precision of the car’s design is illustrated by two elements of the car's silhouette. First, the lower window line, which looks as though it were carved into the body, is continued as a sharp edge into the front fenders. Second, the character line that runs below the window sill is the most important line on the vehicle. At the rear, it is designed as what is known as an undercut. Here, the character line is drawn slightly outward to emphasize the strong shoulder section and generate a light-refracting edge. This undercut reduces gradually as it runs towards the front of the car, where the character line extends into the front wheelarch. For the first time, Volkswagen is interfacing the car's electronics directly with the driver. Based on the driver's biometric data, the Sport Coupé Concept GTE determines, via a smartwatch or armband for measuring the driver's vital functions, whether to select a route that includes an exciting country road or a gentle route instead. The center console rises towards the dash panel where it meets the infotainment system, just like a sports car. Here too, elegant gloss-black and thin aluminum surrounds are dominant styling elements. Forming a contrast to this, beneath the "hovering" design of the console, there’s a layer that looks like natural wood. The same material is found on the door panels and on the steering wheel. Among the practical details are cupholders that can warm or cool the drinks placed in them. The 6-speed DSG has shift-by-wire logic and stays in a central position, like a joystick. The R, N and D selections are activated by a flick of the wrist, while P is set by pushing a separate button that is integrated in the shift lever. If necessary, the system’s power can be distributed to all four wheels thanks to the rear electric motor and an "electric driveshaft". In the sporty GTE mode, the 155 mph coupé accelerates from zero to 62 mph in just 5.0 seconds. Despite this dynamic performance, the concept car has an EC combined fuel consumption of 118 mpg. In addition, the Sport Coupé Concept GTE can be driven all-electrically, with zero emissions, for a distance of at least 32 miles. The total driving range on one tank of gasoline is more than 745 miles. • Coasting: As soon as the driver takes his or her foot off the accelerator and the battery is sufficiently charged, the gasoline engine and electric motors are shut down and disengaged from the drivetrain. • Recuperation Mode: If the driver removes his or her foot from the accelerator or brakes when the battery is not sufficiently charged, both electric motors work as generators and feed the energy generated during braking to the lithium-ion battery. In this case, too, the V6 engine is shut down and disengaged. • Driving with the V6 engine: When the gasoline engine alone is powering the vehicle, the concept car is purely front-wheel drive to achieve excellent fuel economy. "E-Mode". In E-mode, which the driver activates by button push, only the 114-hp electric motor at the rear axle provides propulsive power. In all-electric driving, the V6 TSI is decoupled from the drivetrain by disengaging the clutch, and it is shut off. As soon as the six-cylinder engine needs to be used again—due to the battery's charge state or other parameters—it is coupled to the drivetrain again within fractions of a second without any jolts. The lithium-ion battery, which has a capacity of 10.7 kWh, is responsible for supplying energy to the electric motors.